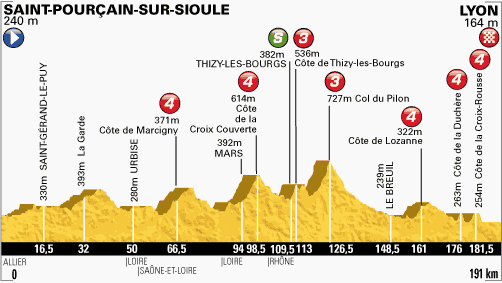 Stage 13 was meant to be a simple sprint stage. 150km or so or fairly dreary racing with the likes of Argos Shimano, Lotto-Belisol and Omega Pharma Quick-Step upping the pace into the finish for the sprinters to go at it. Instead, crosswinds caused huge splits in the peloton and turned the stage into a captivating race. When all was said and done, Alberto Contador, Bauke Mollema and Laurens Ten Dam had taken over a minutes out of Chris Froome, who was left without teammates again, while Alejandro Valverde lost over seven minutes and his hopes of even a top 10 finish look to have disappeared. In a normal Tour, Stage 14 should be one for a breakaway while the rest of the teams recuperate ready for the Alps. However, this has hardly been a normal Tour. Despite this, it seems likely that the only way this does not end in a breakaway win is if Cannondale put in a huge effort to bring it back for Peter Sagan. There are seven categorised climbs and it would be a real surprise if the likes of Cavendish, Greipel and Kittel were not dropped, but whether Cannondale have enough energy left to bring back a break on their own is debatable. The other option is that Peter Sagan might look to get into the breakaway itself. While few teams would aim to bring him back, the breakaway riders themselves would probably rather not have Sagan in there given that they will be eyeing stage victories. So, who are we looking at for potential contenders? The usual suspects are all there. Thomas Voeckler, the four-time Tour de France stage winner, will undoubtedly look to get involved, having saved plenty of energy today. Pierrick Fedrigo won a stage last year and will be looking to win another; Thomas de Gendt has been busy in breakaways so far and might relish the chance to pick up some mountains points; Jan Bakelants has already won a stage this year and looks to be in excellent condition; Sylvain Chavanel always relishes this type of stage. Really, there are so many possible candidates for the breakaway that it will be very tough to pick the actual riders. Looking through some teams that should get involved, Lotto-Belisol have Lars Bak, BMC will look toward Philippe Gilbert, Astana to Alexay Lutsenko, Garmin to Ramunas Navardauskas, FDJ to Jeremy Roy, Radioshack to Jens Voigt. The list goes on. In such a tricky stage, I would suggest to keep your money safe and just hang back and wait for the real mountain stages to get going over the weekend. In these situations, the best bet is no bet.